Exciting trekking to the summit of three active volcanoes in the company of specialist volcanology guide Luca Cosma. Explore the crater-rim zone of Europe's highest active volcano, Mount Etna (3330m), travel by hydrofoil to the picturesque Aeolian Islands and hike to the top of the Gran Cratere on Vulcano Island. Our Sicilian volcanology adventure starts at Catania airport from where we head to our base for the next three nights, the Rifugio Ragabo, located in the pine and birch forests on Etna's northern slopes. Built in the style of an alpine chalet style, this cosy family-run guesthouse is popular with skiers in the winter and walkers during the summer months. It has a great restaurant that serves up typical local specialities such as home-made antipasti, maccheroni with pork and mushrooms and grilled lamb, all washed down with local wines. Luca Cosma is a specialist volcanology guide and will be our trek leader for the week. Born on the Aeolian island of Stromboli, Luca has been leading Explore walking groups in Sicily for over 20 years and is proud and passionate about his homeland. He'll share both his scientific knowledge and stories of growing up in the shadow of a volcano. He leads a warm-up walk this afternoon to see a small lava tube. Today's three kilometre walk is expected to take around one-and-a-half hours. Our hike this morning will take us to the very top of Mount Etna. The highest volcano in Europe, at 3330 metres, it has been in a state of eruptive activity since 2001.Travelling by minibus to the cable car station on Etna's southern flanks, we take the cable car from 1900 - 2400 metres then swap to a four-wheel drive truck. Alighting at 2900 metres, Luca will, (weather and volcanic activity allowing,) guide us on a tour of the top craters including the Northeast Crater which is the highest point (3330m), the Central Crater (the oldest at 2000 years old), the Bocca Nuova, which formed after the eruption in 1968 and the Southeast Crater (the youngest dating from 1971). We should be able to enjoy some superb views all the way to the north coast of Sicily and the volcanic Aeolian Islands lying offshore. Our descent takes us past the eruptive cones from the eruptions of 2001 and 2002 with an overview of the Valle del Bove Caldera, back to the cable car station. Today's nine kilometre walk is expected to take around four hours with a total ascent of 400 metres and a descent of 900 metres. We take a short drive up the mountain this morning to the remains of the ski station of Piano Provenzana at 1900m - most of it was buried by lava in the 2002 eruptions. Our hike follows the solidified lava flows uphill to arrive at the crater line at around 2500 metres. We follow the crater line to the parasitic cone of Monte Nero then continue to the Grotta dei Lamponi, a long cave known as a lava tube that formed when the softer lava inside the chamber eroded. We can explore inside the lava tube with our head torches for several hundred metres before returning to the edge of the 1923 eruption and eventually, Piano Provenzana. Today's 13 kilometre walk is expected to take around five hours with a total ascent and descent of 600 metres. We make an early start this morning to drive to the port city of Milazzo on Sicily's northwest coast, gateway to the Aeolian Islands which are a UNESCO listed World Heritage site. We catch a fast hydrofoil to the awe-inspiring island of Stromboli, a classic cone-shaped island volcano which rises dramatically from the depths of the sea to 900 metres with a cloud of smoke almost permanently gracing its peak. Around its base are some small communities, whose white-washed houses splashed with scarlet bougainvillea, provide a vivid contrast to the dark volcanic rock of the powerful crater behind. The walking on Stromboli is a one of a kind and a spectacular experience as the volcano here is constantly erupting. In the afternoon we climb on a zig-zagging path all the way to the crater rim, a hike of around four hours at a slow and steady pace with plenty of stops to admire the tremendous view. Our aim is to reach the summit for sunset and then to relax and spend some time observing the volcanic activity after dark, the best chance to observe the light show caused by the lava erupting from the volcano. Our descent by the light of our head torches is expected to take around two-and-a-half hours. The top section of the climb and descent of the mountain is on volcanic ash so it's important to have good walking boots and you may find walking poles helpful too. Today's eight kilometre walk is expected to take approximately six-and-a-half hours in total with a total ascent and descent of 980 metres. Departing Stromboli on an early hydrofoil we plan, sea conditions allowing, to stop on the Island of Panarea. The second smallest of the Aeolian's with a year-round population of just 280, it's been a popular summer retreat with the bohemian set since the 1960s. Leaving our baggage at the harbour office, our hike takes us to site of the pre-historic village at Calajunco on a trail that zig zags up and down from sea level to around 150 metres. In the afternoon we catch another hydrofoil to the largest Aeolian island of Lipari where we stay in the port town of the same name. Lipari has a reputation as the liveliest in the Aeolian Islands. This evening we can head out to enjoy some good food and wine in one of the restaurants in the ancient harbour of Marina Vecchia. Today's four kilometre walk is expected to take approximately two hours. This morning we take a small boat to the neighbouring island of Vulcano, named after Zeus' son Vulcan, the God of fire and metalworking. Although now dormant, Vulcano has erupted spectacularly throughout the centuries - the last dramatic explosion being only 100 years ago. In 183 BC a huge eruption gave birth to Vulcanello (the Little Volcano) visible from the port. Today, Vulcano puffs out a steady stream of gases and vapour. Even offshore the presence of the sulphur, which was once mined here, is obvious. Our hike on the island takes us up to the crater rim, 'Gran Cratere' (400 m) for great views of the islands scattered around us. After descending, you may wish to try a mud bath - reputedly an excellent cure for arthritic complaints! Having caked ourselves from head to toe, its then time for a swim in the azure sea - the water here is very warm, an indication of how close the boiling interior of the earth comes to its crust. We return to Lipari for our final night on the Islands. Today's seven kilometre walk is expected to take approximately three hours with a total ascent and descent of 386 metres. We return to mainland Sicily by hydrofoil back to Milazzo and drive south along the eastern side of the island to Taormina. Perched on a cliff overlooking the Ionian Sea, this pretty town is home to many historic churches and a number of lively bars and cafes as well as a Graeco-Roman theatre which is famous for one of the most iconic views in Sicily - that of snow-capped Etna acting as a backdrop to the remarkably preserved columned stage. It was a favourite place during the days of the 'Grand Tour' and was frequented by Goethe, Edward Lear, D.H. Lawrence and many others. Our plan is to enter Taormina on foot , on a downhill walk from the village of Castelmola, perched high above the town. There will be free time here to wander the pretty streets full of cafes, restaurants and souvenirs shops and to pay a visit to the theatre. Our destination for our final night is the seaside town of Giardini Naxos a few kilometres to the south of Taormina. Today's three kilometre walk is expected to take approximately 45 minutes with a total descent of 320 metres. The trip ends this morning at Catania Airport, a drive of around an hour- and-a-half. You will need light layers of clothing for walking during the day and a fleece and waterproof jacket as temperatures can drop on Etna. Gaiters are useful to stop the volcanic ash getting in your walking boots. A sunhat is essential and bring a swimming costume if you wish to bathe in the sea or enjoy the mud baths on Vulcano. We recommend you bring walking boots - leather or fabric are both fine. Make sure that your boots are worn-in and comfortable before the start of the trip. We recommend that you wear/carry your walking boots as hand luggage on the international flight: should your luggage be delayed, your well broken-in boots will be irreplaceable. Bring one main piece of luggage and a daypack. You should bring a resusable 2litre water bottle, sunhat, sunglasses and sunscreen. Trekking poles are highly recommended. You will need a head torch for the Stromboli descent after dark and lava tube. Hard hats are provided locally for the Etna and Stromboli summit hikes. Although entirely voluntary, tipping is a recognized part of life in this region of the world. Some local staff will look to members of the group for personal recognition of particular services provided. In order to make things easier for you, the Tour Leaders may organise a group's tips kitty and if this is the case, they will account for it throughout the tour. Accordingly, we recommend approximately 15€ per person for tipping. 10% is recommended at meal times. For the first three nights of this trip we stay at a mountain refuge - Rifugio Ragabo, in the pine and birch forests on Etna's northern slopes. Built in the style of an alpine chalet style, it's a cosy family-run guesthouse that is popular with skiers in the winter and walkers during the summer months. The rooms are small and simply furnished - all are en suite. It has a great restaurant that serves up typical local specialities such as home-made antipasti, maccheroni with pork and mushrooms and grilled lamb, all washed down with local wines. On the island of Stromboli we stay at Hotel Villaggio Stromboli. Built in a white-washed Aeolian style, there are superb sea views from its panoramic terrace and all elegantly furnished rooms also have their own small terrace. On Lipari, family-run Hotel la Filadelfia is situated in the centre of this lively port town and has a small swimming pool, restaurant and bar. La Riva is a characterful family-run hotel that is located just a few metres from the beach in the seaside resort and fishing village of Giardini Naxos. The en suite rooms are furnished with Sicilian antiques, there is a cosy bar area and great views of the bay from the restaurant. 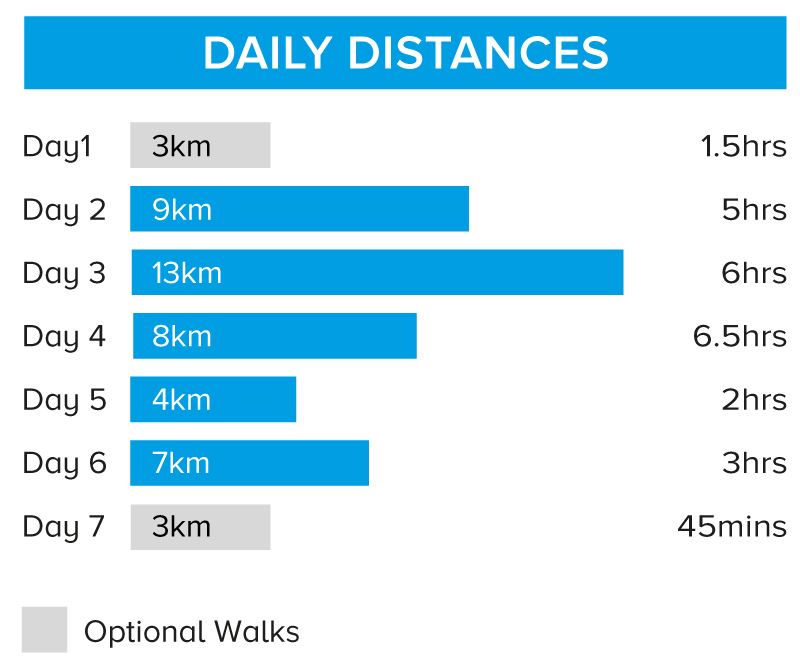 Walks on 5 days for between 2 to 6.5 hours with optional walks on 2 further days. Terrain will be a combination of easy walking trails on compacted volcanic deposits with more challenging sections of loose ash and scree. Max walking altitude 3330 metres. 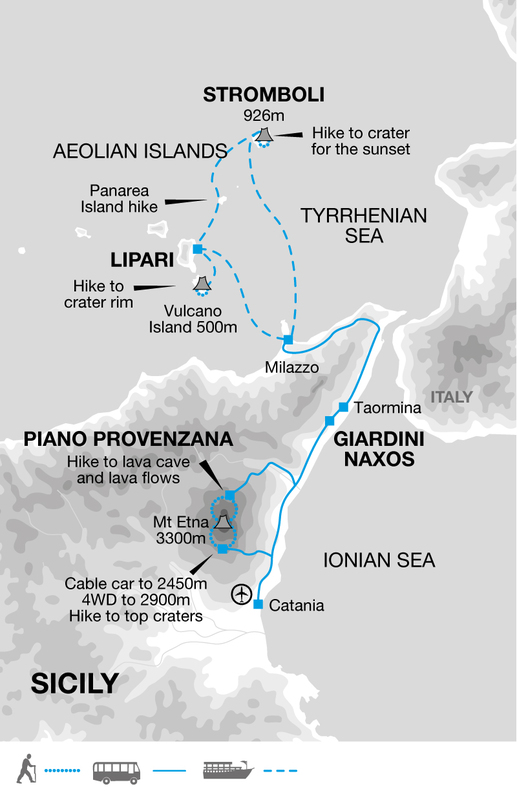 Please note that the summit treks on Etna and Stromboli are weather and volcanic activity dependent. It's possible that the local authorities may decide to close the summits with little or no notice. Should this occur alternative walks will be arranged. Due to the volcanic dust and sulphur fumes on the volcanoes, this trip may not be suitable for asthma sufferers or customers with heart conditions. Explore some of Europe's most active volcanoes on a trip that will both educate and inspire. Trekking in the company of specialist volcanology guide Luca Cosma, this trip includes access to both the barren yet beautiful moonscapes of the top crater zone on Mount Etna and the summit of Stromboli volcano, where we hope to observe volcanic pyrotechnics in action after dark.